I made this set for my granddaughter's birthday. It was fun to make and, although it took a while to create, all the instructional videos that accompany the designs are clear and easy to follow. 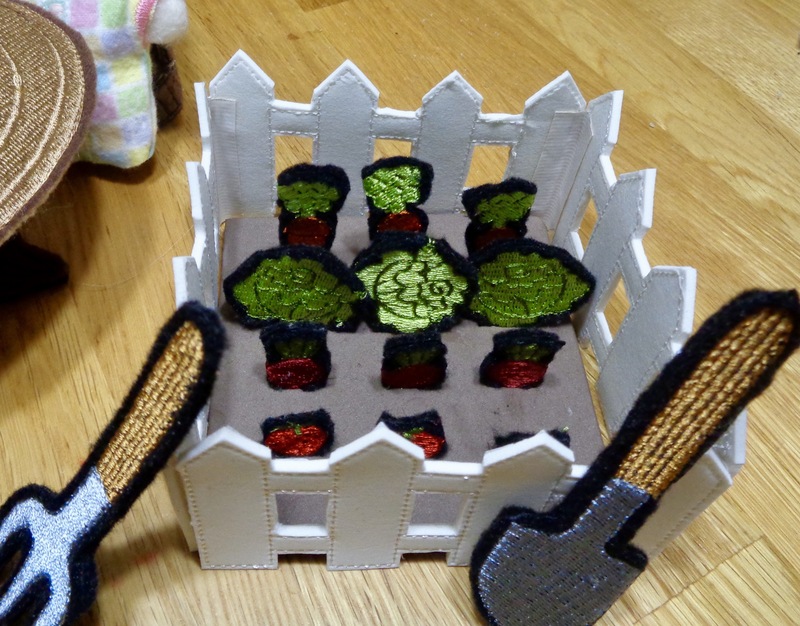 I opted to stitch the fence, tools, table top and vegetables over craft foam, instead of just using tear-away-stablizer as recommended, to give those pieces more heft in hopes they will hold up better through hours of playtime. The second picture is of the foam I used. It comes in various colors and thicknesses. The garden is made using the thickest brown foam they had. Picture #3. What a Awesome set you have done!!!Gorgeous!! Thanks for you kind comment! Thanks, Chris! I really enjoy doing playsets like this and luckily, the children play with them long after they've received them. That makes it all worthwhile. How sweet. This is quiet a different project. I am sure your granddaughter will enjoy testing it out. Looks like fun to me. What a special and detailed play set. I can't imagine stitching through the foam. Do the designs need to created with that in mind when they are digitalized? A beautiful gift to be cherished by your Grand Daughter! Nope, they are regular designs. 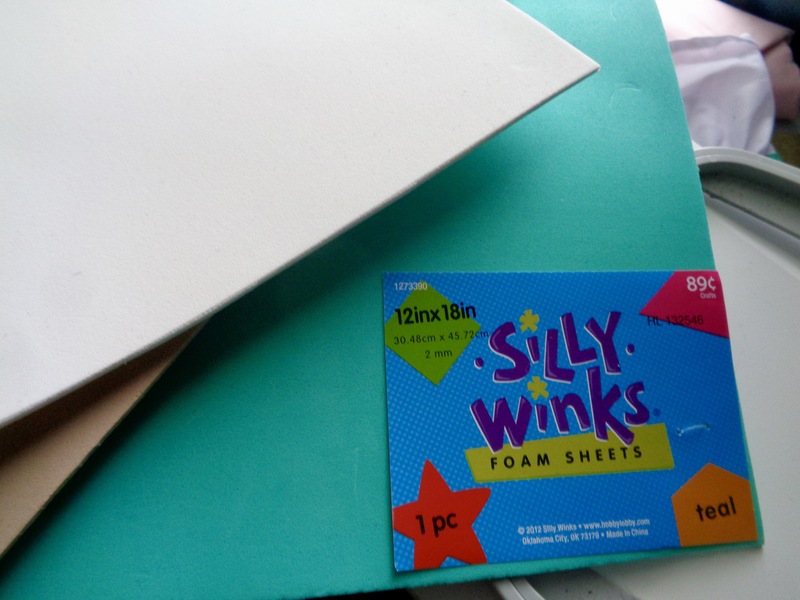 I use the thinnest foam (2mm thick) found in the craft section of Hobby Lobby or JoAnn's. Not the "puffy foam" used with specially digitized embroidery foam designs. I think craft foam was a good move. 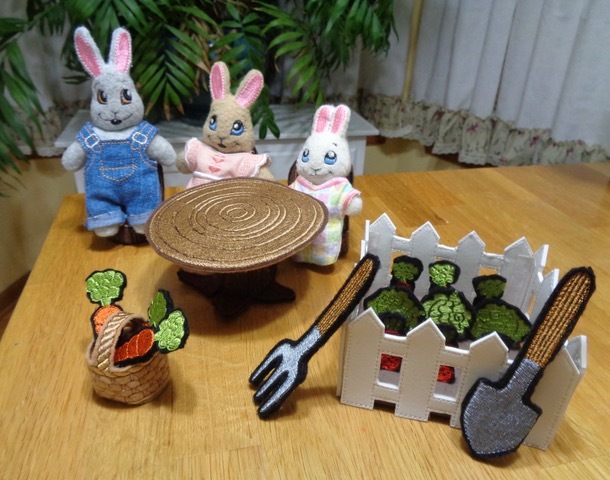 These are sew cute, lots of play time here! I love craft foam! I use it instead of batting when I make ith coasters, too. I hope she enjoys playing with it - I had fun "planting" the garden, LOL! This is the cutest set ever!!! Great job and can be used year after year...I love the bib overalls on the one rabbit, so darned cute!! Thanks, Vicki. Yep, those overalls are too cute. Mama rabbit's dress is made from a scrap I had leftover from making my Granddaghters dresses. oh I love this set, it's great !! Thanks! I think so, too. How sweet! I have never seen a design set like this for play. Of course, I have seen the dolls and clothing, like our paper dolls used to be. She will have hours of play with this. I enjoy just looking at them-lol-but I know she will have them working their garden. Good job! Thanks, Toogie. I fell for their sweet faces and I sure hope she will, too. You can't see it in the picture, but there is a "soil plot" where you can "plant and harvest" the veggies (carrots, beets, strawberries, lettuce) and there are chairs that look like tree trunks.